A WOMEN’S AFL club has confirmed that they are interested in Ladies Football star Cora Staunton. A report on the RTÉ Sport website first reported that Staunton was linked with the Greater Western Sydney Giants (GWS Giants), who finished up this season in eighth place on the AFL Women’s (AFLW) ladder. The club have since confirmed their interest in the four-time All-Ireland winner to The42 following an inquiry. The women’s division of the AFL is still relatively in its infancy, with the Adelaide Crows winning the first ever AFL Women’s Grand Final against the Brisbane Lions back in March. 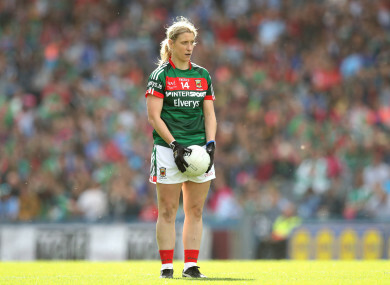 An integral part of Mayo Ladies football, Staunton recently made her seventh appearance in an All-Ireland final, where she hit seven points in her side’s defeat to Dublin in front of a record-breaking crowd at Croke Park. Meanwhile, fellow Mayo star Sarah Rowe has also reportedly been linked with a move to the AFLW according to RTÉ Sport. Various clubs have expressed an interest in the Mayo forward. Email “Women's AFL club confirms interest in Mayo star Cora Staunton”. Feedback on “Women's AFL club confirms interest in Mayo star Cora Staunton”.